Kids can learn so many positive lessons when they play outside. But to really get the most out of the great outdoors, parents can strive to raise an outdoor-loving child. CubbyKraft can help with our awesome backyard kids toys. When kids see one of our cubby houses or forts in their backyard, they can’t wait to get outside to play. Parents find they have more trouble getting them to come back in. Take it slowly. Don’t decide one day that you are going to be an outdoor loving family and the next spend the entire day outdoors. Instead, schedule fun outdoor activities to do outside on a weekly basis like family hikes, backyard picnics, etc. When you find some activities you like and do on a regular basis, ad another one. Don’t get frustrated if it takes longer than you thought it would. When you have kids, you learn that doing activities can take more time then you may have thought possible. It’s okay. Tear up any agenda you may have and go with the flow. If you don’t get to everything you wanted to do, plan the activities you missed for another day. Talk and listen. Enjoy this bonding time with your children. Talk to them about when you were kids and listen to their thoughts. being outside together is a wonderful time to have conversations even with young children. Point out things in nature and ask them what they think. You will love the wonder you see in their eyes, mind and heart. Kick the kids out of the house, every single day. When kids sit inside too long playing video games or watching television, they get into a bad habit of not getting enough outdoor time. Kids need to spend 60 minutes a day playing outside for healthy development and growth. 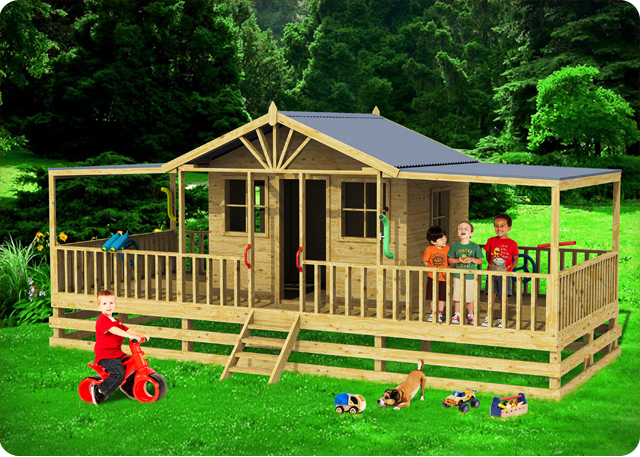 But having a CubbyKraft cubby house or fort, you will have a much easier task getting your kids out. Walk the talk. Learn to do as you say and show your kids how much you love the outdoors. Enjoy activities in the fun world of nature with them at least once a week. Go on hikes, bike riding or whatever you family likes to do outside. Are your kids so full of energy they cannot sit still? Kids have this energy because they are growing. Their body is telling them that they have to move for healthy development and then it gives them the energy to do that moving. This is why your kids need you to provide them with a place for active play. That is where the Brisbane Deluxe cubby house can help. With a backyard kids toy like this one, your kids will be outside playing in it all day long. When they use up all their energy playing outside, they will come in and get a good healthy night’s rest.